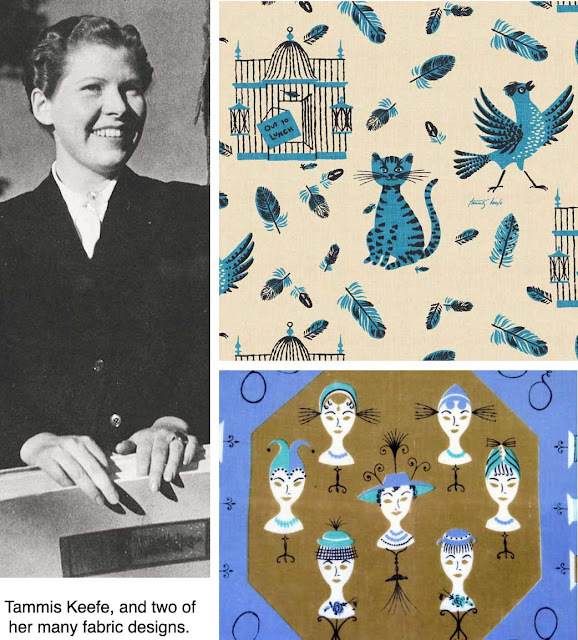 Tammis Keefe lived in Ridgefield only four years, but they were her last four years and the acclaimed fabric artist chose the town to be her final resting place. Born Margaret Thomas Keefe in 1913 in Los Angeles, Calif., she was called Peg by her family but preferred Tammis, which is Gaelic for Thomas. She studied at the Chouinard Institute of Art (now part of the California Institute of the Arts), and went to work for the Disney studios. She later became art director of the “Arts and Architecture” magazine, and in the late 1940s began designing handkerchiefs for Kimball scarves. “Handkerchiefs are fun to do, and I try to make them fun to give,” she told The San Francisco Chronicle in 1949. By the mid-1950s, Ms. Keefe had become one of the first women fabric designers whose signature appeared on her work, mostly handkerchiefs, linen kitchen towels, tablecloths, and scarves. Lord & Taylor purchased a full-page advertisement in The New York Times for a “Meet the Designer” day to introduce her and her fabrics. She was featured in many newspaper articles, magazines and books. Ms. Keefe came to Ridgefield in 1956, making her home on New Road with author and ad executive Jane Trahey. She died four years later at the age of 46 and is buried in St. Mary Cemetery. Long after her death, she has been rediscovered through inclusion in events such as “A Woman's Hand: Designing Textiles in America, 1945-1969,” an exhibit of work by women designers at the Fashion Institute of Technology in 2000. Her work is now in many collections and museums, including the Metropolitan Museum of Art, the Smithsonian Design Museum, the Henry Ford Museum, and the Brooklyn Museum.